Like I said in the "bought/messed with,etc today", I rebuilded my 5x86 but I'm having issues at making the GUS to work with the sound blaster 16 in the computer. When I did set up the gus without the sb in the computer, everything was ok (except for windows 3.11, I'll explain this later), games launched properly, etc. Then I did put back in the sb 16. 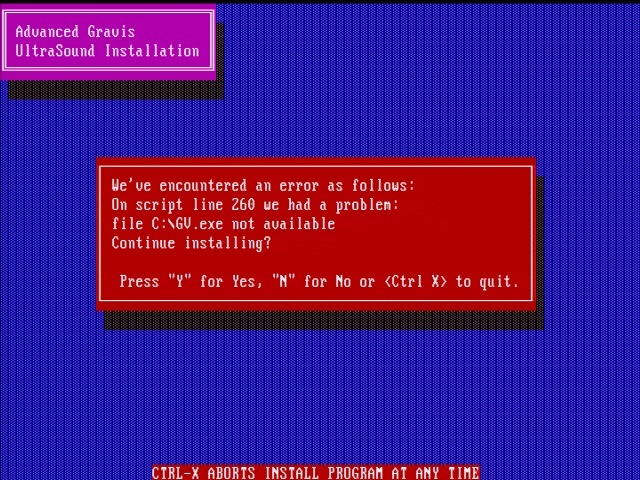 Doom 1 and 2 were still working using the GUS, however one must fall 2097 now crashes. I tried to re-run the setup for the GUS, everything is fine at first, (I can select irqs, dmas, etc, the tests are okay) but once all the tests are made, it goes to another screen where the scrolling text says that it's testing the roland emulation. And then it says that DMA1 can't be used ... except that I never ever chose DMA1, and I can't even touch that setting. After this, Doom and Doom 2 don't start anymore. What should-I do ? This is my first GUS, I might be missing something there. Should-I take out the SB16 again to set up once again the GUS ? Should I forget to use these two sound cards in the same machine ? Also, like I said I can't get windows 3.11 to output sound. The setup program did install everything for me under windows, but when windows wants to play sound, all I can hear is a short "pop!" and that's all. Location: USA Seems like it might be a resource conflict. Syschk should tell you what irq's are being used by the motherboard, or windows 95 device manager of course, and then you can go from there disabling stuff. Parallel port is usually irq 7, and 11 is sometimes taken up. 240 can be swallowed up too. It can be really difficult to find free resources with some of these older motherboards. My cyrix 586 system was a bit of a pain to finagle enough resources out of the motherboard to get my ensonic card working. Not having a GUS though, I am totally guessing by how hardware usually reacts to conflicts. Paul might have a better idea since he has a GUS. Location: Hull, UK Unfortunately not, I never got this to work. My only thoughts would be, try swapping the IRQ for the GUS and SB16. Also, make sure you disabled the parallel port on your system if possible. Your motherboard resources might be using DMA1 or DMA3, especially if it has a VLB drive controller onboard (practically any 486 board beyond 1993, regardless of available slots and, presumably, some older Pentium boards) and this can sometimes be changed, you'll fare better having it shared with the SB16 than the GUS if you can't fee it up. You don't seem to be infringing upon any of the IRQs that would normally cause problems (I always keep this handy) but it wouldn't be unheard of for a board or card to be hogging one for no apparent reason... This isn't a SB16 PnP is it? Like a Vibra or something? I've had those cause problems before with other devices thinking resources are used up, Creative's PnP implementation seems to be rather clumsy. I have never used a GUS under Windows 3.11 so I have minimal experience there, but I think it's safe to say it probably won't work if there are resources which need clearing up first and therefore isn't worth investigating until that problem is solved. IRQ 14 – IDE Interface (One Channel Only, not used but can't turn this off, we could cut the trace on the I/O card. Notably the Maui could easily conflict with the PAS16 and even when the addresses don't match, the setup application will not allow MPU emulation to be active on the PAS at the same time. This is fine as the Maui has an external MIDI interface and can itself be muted in the PAS mixer (uses internal AUX port) if I need to use a module, the PAS still has dumb external MIDI in Windows without the MPU function being turned on. The WinTV and Diamond card conflict between D000 and E000 due to undocumented features of Diamond cards, this is an obscure situation and not well known. The SCSI card does not like operating on certain IRQs, nor does the Maui. I use both serial ports as I have a modem connected at times, usually if my internet goes out. Using IRQ 12 is flaky because some chipsets reserve this for PS/2 ports regardless of it you have one, mine actually does (SiS 5000) despite not having a port or a header, but the WinTV seems immune to this. The Maui and the Ethernet card are not and refuse to work here, the Diamond card will also occasionally freeze MPEG playback if set to this address, though oddly the video will resume if I hit Play again instead of crashing the system. Remember IRQ 2/9 are cascaded. Basically, lots of trial and error. Then I moved the Irq of the SB16 to 5 (obviously I re-ran diagnose) but still nothing for omf. However I tried doom (I forgot to do this earlier) and it worked ! Jazz jackrabbit can't even see the gus when the game starts up however the setup program sees it. So it seems the issue is concentrated on epic megagames' games. I forgot to mention in my first post that I tried duke 3D too. But the setup program complains about the IRQ being higher than 7 (or 11, can't remember) ... even though my IRQs were set to 5. I didn't try it this time though. Location: Hull, UK Odd thought and unlikely to be your issue, but have you tested the memory on the GUS? There should be a utility included with the drivers for that. Mine showed all kinds of errors when one of the chips was busted, but they were random. Otherwise, unless you can exclusively disable SB emulation, I feel like the error won't go away, hell, I sometimes got it without another card being installed and I certainly never got this card to work alongside another, there simply weren't enough resources and there were always problems. Epic games are supposed to have timing problems on faster systems which make detection fail, I had no problem on a 233MMX, but that was in a Packard Bell which was commonly outran by even a fairly modest 486, I am unsure as to whether this was patched. Yeah, that's due to the turbo pascal compiler bug. But there don't seem to have any timing issues here. The timing issue affects the begining of the program IIRC. I know that if I try to start jazz jackrabbit on my pentium 2, the game will crash instantly. But if I desactivate both caches, the game starts and then I can re-enable both caches and the game still works like a charm. For some reason, One Must Fall 2097 don't crash on pentium 2. They probably used another programming language or another compiler. But both games have issues with the GUS, and Windows as well. These probably do something with the card that Doom don't. I've tested the card's ram several times and it never reported any errors. Location: Hull, UK Mine always threw errors, but I put it down to the Packard Bell it was in. It may be worth testing in another machine, but I have always thought they were just a bit of an awkward device overall. Another long shot, disable cache and memory managers whilst setting the card up. I have never tried this with the GUS, but my Terratec will not play ball (The configurator will even freeze when writing to the EEPROM) if L1/L2 Cache is enabled, though it doesn't care if you turn it back on afterwards. There are a few devices like this and when programming chips it seems the system invariably likes to have cache to be turned off, perhaps this is another case of the same problem. Again, you will be able to turn it back on if all goes to plan setting the card up. For futur audience : the problem is now solved, at least for the DOS part : never set the GUS' Address to something different than 220, it will upset most programs ! Using Gravis Ultrasound cards along with others has been my experience for the last 4 years or so. Although its fine if you don't have anything else, i'm not a big fan of the Sound Blaster 16 CT1740. These are noisy as heck, although at least the 4.05 DSP is bug free and there's no wavetable hanging notes. When using multi sound card configurations i usually prefer to use PnP cards. They generally do not hog resources as jumper config cards usually do. Early Sound Blasters are such an example. I have an original Pro Audio Spectrum configured with IRQ 3 and DMA 3. If i use any non PnP Sound Blaster along the PAS the driver stops finding the card. Even if i set the SB (doens't matter if it is 1 1.5, 2.0, Pro 1, Pro 2) to IRQ 5 DMA 1 and the PAS is IRQ 3 DMA 3 the damn SB's stops the PAS from working. I think its the way non Pnp cards hog the 388h port. This frees a lot of resources for other cards. Because i use a Yamaha OPL3SA YMF-719E which is PnP, i could actually use normal SB resources for a PnP Sb AWE card and use a batch file to select between the 2. And yes i use Yamaha XG for General MIDI because i like it 1000000000 times better than Sound Canvas. Location: Hull, UK We don't use Sound Canvas stuff around here. For the record, I set my GUS up again as the only sound card in a system (well, technically, there's a sampler in there but that doesn't really count) and it does still throw the odd error in setup for whatever reason, honestly convinced it's just a thing they do. And for anyone curious, these are the resources it uses that seem to work. As always, it's awkward as all hell in Windows though.